What does Hometown Sheds offer? Try amazing options! Browse through our attractive, residential grade storage units to find the perfect shed to fit your home or business and then choose between our different financing plans. We also include delivery and set up. Stop by our lot today to find out more! Do you want a treated wood or painted building? An A-frame or barn style roof? Cedar siding or a premium grade SmartPanel® siding? These and more are all features that we offer at Hometown Sheds! It is our goal to provide a safe, protected environment for your items in need of storage. Don't forget about our newest option - the electrical package, only $125! 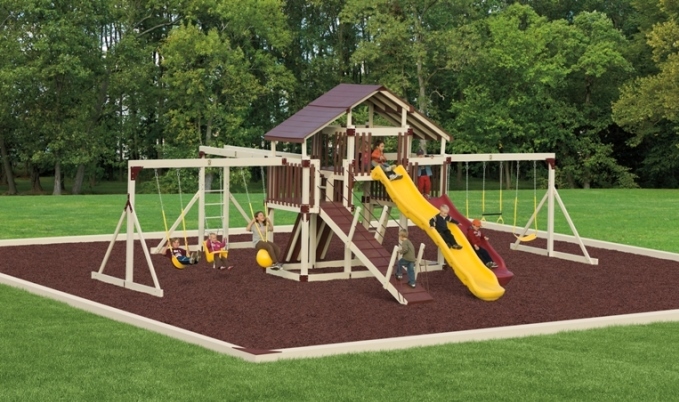 What makes a playset from Hometown Sheds so wonderful? Not only do we have an amazing variety of designs & features for you to choose from, each set is also hand built by the Amish with attractive vinyl siding so your kids can be splinter free. Since we also arrange for delivery and set up, that means you can easily get down to having fun! At Hometown Sheds, what you pay for is what you get! That means when you visit one of our lots to purchase any of our quality steel buildings, we won't run any bait and switch schemes AND we will even deliver and set up your purchase for you. Our financing plans come with low monthly payments and every structure even has a one year manufacturer's warranty! At our Hometown Sheds locations we have a limited selection of pre-owned wooden buildings and metal sheds that we offer to you at great savings. Take a look at what we currently have at our various lots, and you may find just what you're looking for. Our inventory of used buildings is constantly changing, so check back often. There are dog houses - and then there are specially crafted dog kennels like the ones at Hometown Sheds. Our beautiful dog kennels give your dog all the comforts of home. Take a look!